The employees and managers at Mesquite Fuels and Agriculture will take every precaution to ensure that the clearing process meets your expectations with minimal interference to your property. We are dedicated to making this a positive experience for the landowner, their representatives and staff. Below are some of the steps that are followed during the removal process to ensure a successful removal program on your property. You will also find this same information in greater detail in the Timber Lease Agreement. For a copy of the Timber Lease Agreement contact us. Step 1: Approximately 30 days before a crew begins cutting trees a Mesquite Fuels and Agriculture land manager will visit with you and/or your representatives to lay out brush patterns, trees to be preserved, access to the trees, and other topic’s necessary to allow for your input to the harvest process. Step 2: As tree removal starts the land manager will be present at your site to answer any questions as well as carry out the plan laid out 30 days before. Step 3: In most cases trees and stumps will be air-dried in the field before handling to a plant site. 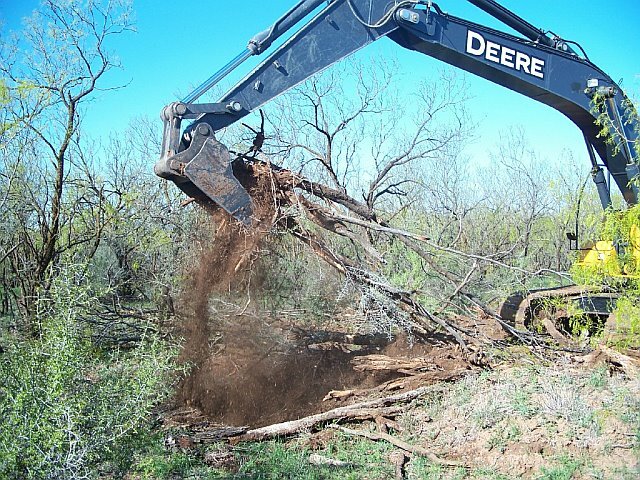 Step 4: After completion of the tree removal and within two weeks the same land manager will visit with you to ensure that Mesquite Fuels and Agriculture left your land in a manner that is approved by you. PLEASE NOTE: You may call our corporate office 972-871-2111 at any time and your call will be directed to one of our land managers. You will also have direct access to your land manager via cell phone.